The Toyota Aygo is a city car sold by Toyota in Europe since 2005. All Aygos are built at the new factory of the Toyota Peugeot Citroën Automobile Czech (TPCA) joint venture in Kolin, Czech Republic. The Aygo was first displayed at the 2005 Salon de l'Automobile de Genève. 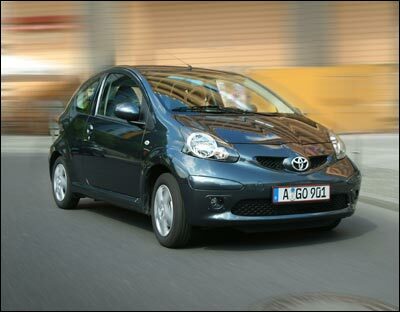 The name "Aygo" comes from "i-go", symbolising freedom and mobility. The decision to produce the cars was made on July 12, 2001, when the presidents of Toyota and PSA Peugeot Citroën, Fujio Cho and Jean-Martin Folz respectively, decided to produce a small car to share development costs. This project was called B-Zero. The Peugeot 107 and Citroën C1 are rebadged versions of the same car. The Toyota Aygo's starting on-the-road price is €8,500 (GB£6,845). 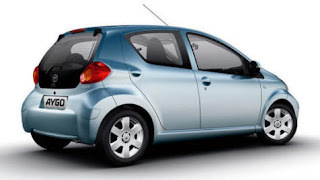 The main difference between the Toyota Aygo and its siblings is in the interior equipment, badges, logos and the easily recognizable rear end of the car. The planned production is 300,000 cars annually – 100,000 cars per brand. Sales began in July 2005 and the car is available as a three or five-door hatchback. There are two engines available, a 1.0 L three-cylinder engine rated at 68 bhp (51 kW), and a 1.4 L HDi diesel I4 engine rated at 54 bhp (40 kW). The Aygo has a 4-star EuroNCAP rating. The Aygo was used on BBC's Top Gear in a giant match of football, showcasing its maneuverability. The Top Gear presenters deemed the Toyota Aygo and its Peugeot and Citroën counterparts to be competent town cars. A modified Toyota Aygo was also used on Fifth Gear to perform a 12 metre high loop-the-loop on a specially-designed track to determine if a stunt that can be done using Hot Wheels toys can be replicated in real life. The stunt was driven by UK Stuntman Steve Truglia in May 2009. 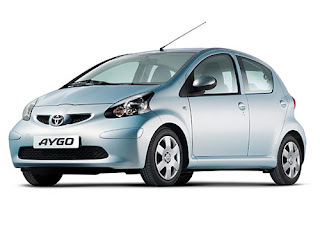 In January 2010, the Toyota Aygo was part of a worldwide recall by Toyota for a faulty sticking accelerator pedal. Under certain circumstances, the pedal can stick in a partially depressed position, or return slowly to the off position. All models built between February 2005 and August 2009 could be affected. 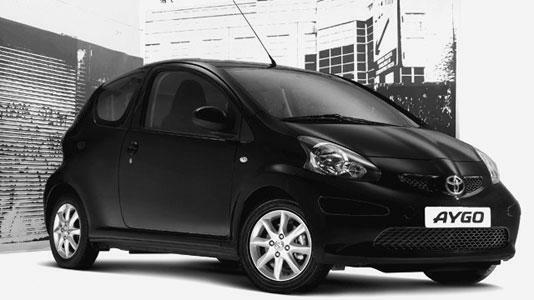 The recall has also affected the Toyota Aygo's Peugeot and Citroën counterparts as well. New information from Toyota has suggested, however, that only Toyota Aygos with automatic gearboxes are affected, and that those with manual gearboxes are not. In 2011, an Toyota Aygo police car was spotted in Chippenham, Wiltshire.